The Cumberland Gap Tunnel is a 4-lane twin-bore mountain tunnel that is 4,600 feet long, and it carries US-25E under Cumberland Gap between Tennessee and Kentucky, and it was completed in October 1996 at a cost of $280 million. 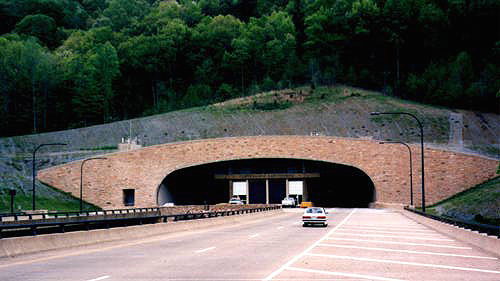 The tunnel project was administered by the Federal Highway Administration's Eastern Federal Lands Highway Division, for the National Park Service. This is the Tennessee portal, and you can see the viaduct approach to the tunnel. Photo by H.B. Elkins, offered to my website in November 1997. I followed this project since it started in 1980. This is not a high-priority Interstate highway, but is an rural arterial highway corridor that is being progressively upgraded to four-lane arterial standards with town bypasses. I have never been to the Cumberland Gap area; as much as I would like to, it is 422 miles from Richmond, and it is not on the route of any other destination of mine. The tunnel's east portal is in Tennessee, and the west portal is in Kentucky. The tunnel is 4,600 feet long with Kentucky having the longer portion. According to the USGS map of the tunnel area, the tunnel does not pass through or under any part of Virginia, but comes within about 1,000 feet of the Virginia geographical feature known as Virginia Corner. Virginia Corner is the westernmost tip of Virginia. It is 596 highway miles from Chincoteague, the farthest place in Virginia from Cumberland Gap. The tunnel is very important to Virginia, however, in that it replaces the section of US-25E that passed through the tip of Virginia. U.S. 25E in Tennessee and Kentucky and U.S. 58 in Virginia are being developed to four-lane arterial standards with completion in the not too distant future. The Cumberland Gap highway has always been a key link in Virginia's highway system, as well as those of Tennessee and Kentucky. A major purpose of the tunnel project, was to replace the sections of US-25E and US-58 in the Cumberland Gap area, so that those highway sections in the Gap could be demolished and obscured and the ground be restored to the original wilderness path. The tunnel project also provided a needed modern 4-lane highway through the area. U.S. 58 across the southern tier of Virginia from Cumberland Gap to Virginia Beach is being upgraded to four-lane arterial standards with town bypasses. The 508-mile Route 58 Corridor Program hopes to complete the job by 2005, and it is about 70% complete now. Seventeen years in the making, the Cumberland Gap tunnel project has spurred highway expansion in three states, hopes for tourism in small communities near the Gap, and dreams of restoring the wilderness trail that Daniel Boone blazed in the 1700s. The tunnel is "the most significant thing that has happened there since Daniel Boone began to bring settlers through the Gap," said U.S. Rep. Hal Rogers, whose district includes parts of southeastern Kentucky. Rogers stuck with the project through its tough, early years, when Congress annually took a vote on whether to continue paying for the construction. At the urging of Rogers, a member of the House Appropriations Committee, the project eventually became part of a highway budget that didn't need annual reauthorization. The Cumberland Gap project has cost the federal government about $280 million, more than twice the estimate from the early '80s, Rogers said. That's mainly because the mountain yielded some surprises for engineers, including a system of underground streams, he said. The twin tubes -- one southbound, one northbound -- are located in Tennessee and Kentucky. Each state will spend about $1 million a year to maintain the tunnel, and about 40 people will work there. The tubes replace a dangerous, 2.3-mile stretch of U.S. 25E, which links the town of Middlesboro, Ky. to Cumberland Gap, Tenn. Over the years, the highway has picked up an unpleasant nickname -- Massacre Mountain -- because of the number of motorists killed along it. To Kentucky officials, the new tunnel means not just a safer route into Tennessee but also a magnet for tourists. As an offshoot of the project, the state of Kentucky spent about $70 million to make U.S. 25E a four-lane highway from Barbourville to Pineville, about 20 miles north of Middlesboro. On the Tennessee side, a similar expansion of 25E is under way from Morristown to the Gap. That means people traveling south on I-75 to pick up the major interstates of I-81 and I-40 in Tennessee can knock about 40 miles off their trip, said Charles Vial, superintendent of the Cumberland Gap National Historical Park. Instead of going to Knoxville and then heading east, motorists would pick up U.S. 25E at Corbin and travel southeast to the intersection of I-81 and I-40. I-40 is a major route to the Carolina coast, while I-81 takes motorists through Virginia and Pennsylvania to New York and other East Coast points. The four-lane 25E also provides an easier route into the Smoky Mountains, Vial said. Partly because of the tunnel, the number of cars passing through the Gap is expected to double from 18,000 a day to 35,000 a day by the year 2020, Vial said. The park currently gets 1.2 million visitors a year. The tunnel will boost that number, not just because it's safer but also because tourists will be attracted to the restored wagon trail that will replace the old U.S. 25E over the mountain, Vial said. To answer a few lingering questions that have come up recently here in m.t.r. : Yes, US 58 has been extended further into Tennessee now. The "old-old" 25E-58 intersection which used to be in Virginia is drastically different. The old US 58 alignment is now blocked off with a large dirt fill. Traffic is permitted up to the old intersection, then is diverted on Cumberland Avenue back into Tennessee to the town of Cumberland Gap. The old route of US 25E north into Kentucky is blocked off with "road closed" signs and Jersey barriers, where the pavement will be removed or covered and the Gap eventually returned to some semblance of what it was back in the 1700s. The "new-old" 25E-58 intersection in Tennessee, south of the "old-old" intersection in Virginia, has not been changed. Traffic heading west on US 58 must stop and turn left onto the old alignment of US 25E. I do not know if any changes to this intersection (which is now only 15 years old, at most) will be made to make US 58 a non-stop, through route. US 58 has been extended westward along the old route of US 25E to a new trumpet-style interchange with the new alignment of US 25E just south of the tunnel entrance. The approximate distance is one mile. I did not see any signs along this section of US 58 designating that the portion of the highway in Tennessee is maintained by Virginia, as was once reported on this group. Apparently Tennessee is now maintaining that portion of US 58 within its own borders. Signage in Tennessee appears to be done to Tennessee standards, rather than to Virginia standards. In fact, one TO US 58 shield on Cumberland Avenue in Virginia seems to be a Tennessee shield, rather than a Virginia shield.  Class 1 cargo (explosives) are prohibited in the tunnel. At least one approach road (US 119 in Harlan County, 40 miles to the northwest) has a sign informing motorists of this restriction. Unfortunately, the sign comes *after* the point where motorists should choose their alternate route detour (which would be US 421 south from Harlan, Ky. to Pennington Gap, Va., then US 58A and US 58 west to Cumberland Gap). This tunnel is one mile long and has twin tubes, with two lanes in each direction. However, the tunnel has electronic messages boards that remind motorists to "Stay in Lane," so lane changing is prohibited in the tunnel even though there are two lanes in the same direction. The speed limit in the tunnel is 45 mph. Since traffic in the national park was becoming overwhelming, the tunnel was built and completed recently to route traffic away from the Gap. Funding came from the National Park Service, the federal highway fund, and the states of Kentucky and Tennessee. The cost of the tunnel construction was $280 million. The Cumberland Gap Tunnel project is a massive design and construction task combining many areas of engineering expertise with innovative construction techniques - one of the Federal Highway Administration's and National Park Service's most challenging projects to date. It includes the construction of a pair of 4600-foot-long, two-lane tunnels through solid rock and rerouting a major highway to enable the restoration of the area to resemble as closely as possible the path used by the pioneers of the late 1700's - all while adhering to ongoing concerns of safety, National Park Service interests, and the Gap's unique environment. Administered by the Federal Highway Administration's Eastern Federal Lands Highway Division for the National Park Service, the Cumberland Gap project brings together the expertise of many design consultants and construction firms in perhaps one of the most ambitious construction projects ever encountered in the southern Appalachian region. The Cumberland Gap Tunnel by the National Park Service. Replacing the narrow, winding road through historic Cumberland Gap with a set of tunnels has been one of the most important public works projects ever carried out in Kentucky. The Cumberland Gap Tunnel Project started in 1991 and was completed in 1996. Its central feature was the boring of two 4,600-foot tunnels through the solid rock of the mountain and the construction of access roads in the Cumberland Gap National Historic Park. The tunnels are a showcase of sophisticated modern transportation technology and environmental sensitivity and have largely restored the area to its appearance at the time Daniel Boone and other pioneers first settled there. Today, more than 24,000 vehicles pass through on a daily basis. Cumberland Gap Tunnel ITS Project - this project is a collaborative venture between the University of Kentucky Transportation Center, TRW and the Kentucky Transportation Cabinet. Pictures of Cumberland Gap Tunnel by the Kentucky Transportation Cabinet. Four photos; two of the Tennessee approach, one of the traffic control center, and one of the inside of the tunnel. Old US 25E : Crossing the Cumberland Gap by Robert V. Droz of U.S. Highways. Includes 33 photos of the abandoned highway. Cumberland Gap Tunnel Paves the Way for Economic Development, by Union College Express, October 15, 1999.